SE Super Ekspres is one of the well known bus operator based in Shah Alam, Selangor. SE Super now served about 40 daily routes across Malaysia, Singapore and Thailand. 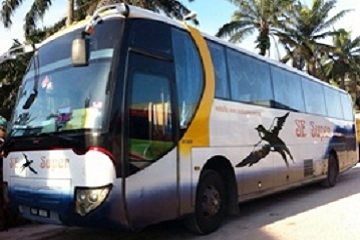 It is famous in providing express bus services from Selangor and Negeri Sembilan to Southern and Northern region of Peninsular Malaysia and to Hatyai, Thailand. Routes offered by SE Super Ekspres are from Klang, Selangor to Golden Mile Complex, Singapore, Seremban, Segamat, Johor Bahru Larkin Terminal, Changlun and to Hatyai in Thailand. Besides, SE Super provides bus services from Shah Alam Terminal to Seremban, Labis and Segamat. In addition, bus services from SE Super also include routes from Seremban to Singapore, Johor and many more. SE Super Ekspres offers affordable bus tickets for its customers. Bus ticket price from Klang, Selangor to Golden Mile Complex, Singapore is at RM 55 while bus ticket price from Klang, Selangor to Hatyai, Thailand is only RM 63. In addition, the ticket price from Selangor to Johor is between RM 23.5 to RM 42. SE Super Ekspres buses are renowned for its comfortable seats and ample of passengers’ leg room. The buses are equipped with air-conditioning and on-board television and are mainly 44 seaters in single deck. 444, Jalan Sena, Taman Datuk Hormat, 46000 Petaling Jaya Selangor.